Some new Star Wars: Episode VII information has been announced, including some character details and when the movie will be set, as well as when the movie officially begins shooting. In the announcement it has been revealed that Episode VII takes place around 30 years after the end of Return of the Jedi, and that the characters will include a trio of young new leads and some familiar faces. 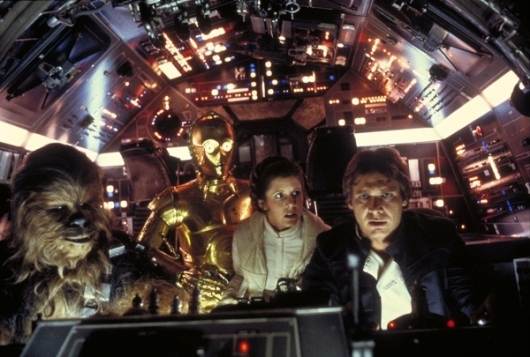 This is all in line with what’s been expected; being set 30 years after the events of a movie that came out just over 30 years ago allows for the expected appearances of characters like Han Solo (Harrison Ford), Luke Skywalker (Mark Hamill), and Princess Leia (Carrie Fisher) without any aging issues. In addition to the new information, it’s also been revealed that the movie will officially begin filming just a couple of months from now in May. The first day of filming for every Star Wars movie has been well-documented, and you can read about all six of those first days below. * March 22, 1976 — The first day of principal photography in Tozeur, Tunisia, for Star Wars. A crew of 130 ventures into the desert in 42 trucks and cars, including eight army trucks full of equipment. The first shot was completed at 9:35 a.m.
* March 5, 1979 — The first day of principal photography in Finse, Norway, for The Empire Strikes Back. The crew endures the subzero temperatures, frostbite, heavy winds, and avalanches to pull off the first shot within 65 minutes of setup. * January 11, 1982 — The first day of principal photography at EMI Elstree Studios outside of London for Return of the Jedi. Although inside a studio, the set must weather a sandstorm in a scene that would ultimately be cut from the film. * June 26, 1997 — The first day of principal photography at Leavesden Studios in Hertfordshire, England, for The Phantom Menace. Ending a long absence from the director’s chair, George Lucas shoots a sequence in a bluescreen-lined set with actors Ian McDiarmid and Ray Park. * June 26, 2000 — The first day of principal photography for Attack of the Clones at Fox Studios Australia. In their new home Down Under, the production crew once again photographs actor Ian McDiarmid three years to the day after Episode I started shooting. * June 30, 2003 — The first day of principal photography for Revenge of the Sith at Fox Studios Australia. The first scenes shot feature Hayden Christensen and Ewan McGregor as Anakin Skywalker and Obi-Wan Kenobi, respectively, along with R2-D2. Star Wars: Episode VII is currently scheduled for a December 18, 2015 release date.